+++SOLD+++ 525 HORSEPOWER! 0-60 IN JUST 3.7 SECONDS!! 5.2L V10 ENGINE! 2011 AUDI R8 SPYDER FOR SALE. OVERALL THIS R8 IS IN EXCELLENT CONDITION INSIDE AND OUT. ALWAYS SERVICED, NON-SMOKER, GARAGE KEPT. CLEAN CARFAX SHOWING NO ACCIDENTS AND 21 SERVICE RECORDS!! HIGHLY OPTIONED WITH; 5.2L V10 ENGINE, 6 SPEED AUTOMATIC TRANSMISSION, PADDLE SHIFTERS, NAVIGATION, POWER CONVERTIBLE TOP, LEATHER INTERIOR, HEATED SEATS, BACK UP CAMERA, CARBON FIBER INTERIOR TRIM, LED HEADLAMPS, STEERING WHEEL CONTROLS AND MORE! 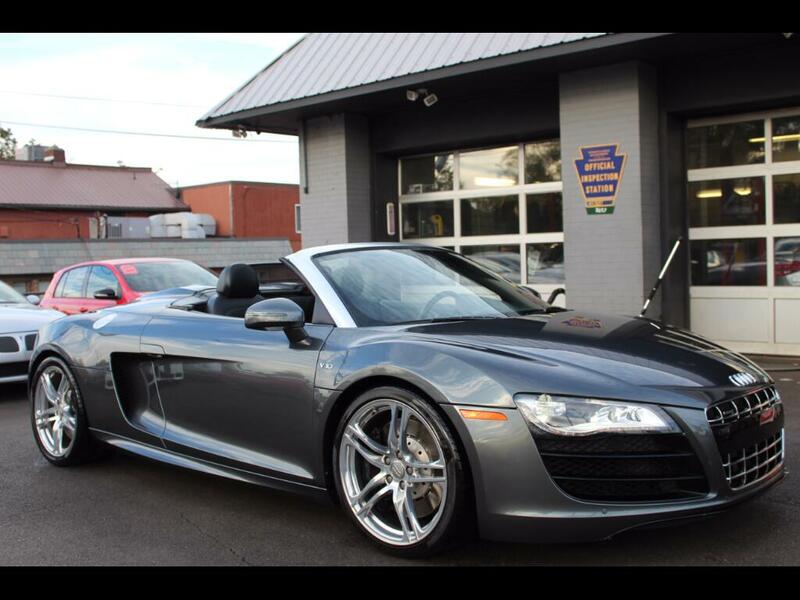 THIS R8 HAS CURRENT PA INSPECTION AND EMISSIONS VALID THROUGH 12/18. TO VIEW THE FREE CARFAX MOST PICTURES OR VIDEO GO TO WWW.LWAUTOMOTIVE.COM. THIS R8 IS SHOWN BY APPOINTMENT ONLY. WE SHIP!! AT THIS PRICE THIS CAR WILL NOT LAST. THIS IS THE CHANCE TO GET A HIGHLY COLLECTIBLE CAR.